alike. Enjoy a special Prosecco tasting in Mazzorbo and explore medieval Padua, once home to Galileo and Copernicus; and much more! person in a Cat 5 stateroom. Saving of up to £1200 per couple is based on a suite, twin share. Book by 31 Aug 2016. 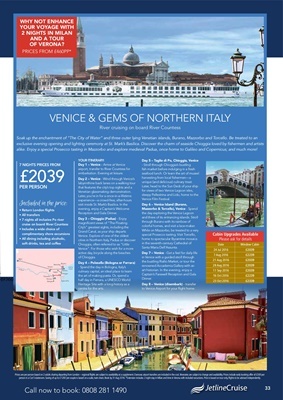 *Extension includes 2 night stay in Milan and time in Verona with included excursions. Price is based on tour only, flights to be advised independently. unique (and delicious) culinary treat. colorful homes, and visit a lace-maker. to Venice Airport for your flight home.